There are two general types of crib mattresses: foam and innerspring. Foam mattresses are less springy and are more lightweight compared to the classic innerspring models. 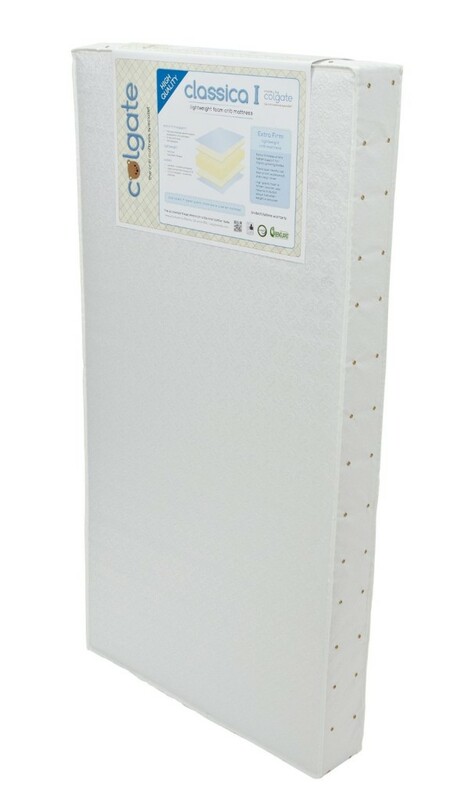 “Green” parents are also looking at eco-friendly, organic crib mattress, which can be either foam or innerspring. Keep in mind, though, that organic is not federally regulated and does not necessarily mean non-toxic. If you are shopping for organic, make sure it has been certified by Oeko-Tex Standard 100, which means that the mattress is free of heavy chemicals and metals. Buying the crib mattress is a difficult, extremely important decision. Take the time to research and make yourself thoroughly knowledgeable on this subject. Federal regulations require that a crib mattress measure at least 27 1/4 inches x 51 5/8 inches and are no thicker than six inches. All crib mattresses must meet safety standards defined by the CPSC (Consumer Product Safety Commission) and the American Society for Testing and Materials. Since babies spend anywhere from 16 to 17 hours, or 70% of their time, in their crib, they need a firm surface to aid in their development and growth. A firm surface is especially important when a baby begins to be more mobile and begin to push up, turn, and stand in the crib. What is a Foam Crib Mattress? A foam crib mattress is usually made of polyurethane, bamboo fiber, or latex, and therefore lighter than the classic innerspring mattresses, and can be regular foam or memory foam. Their thickness varies from three to six inches. The better foam mattresses are higher in density. Unfortunately, manufacturers do not usually list density in their product’s specifications. Remember this: the heavier the mattress, the denser it is. Since their first production, advancements have allowed manufacturers to produce foam mattresses that have become as durable as innerspring. Also See: What is the Best Organic Crib Mattress? 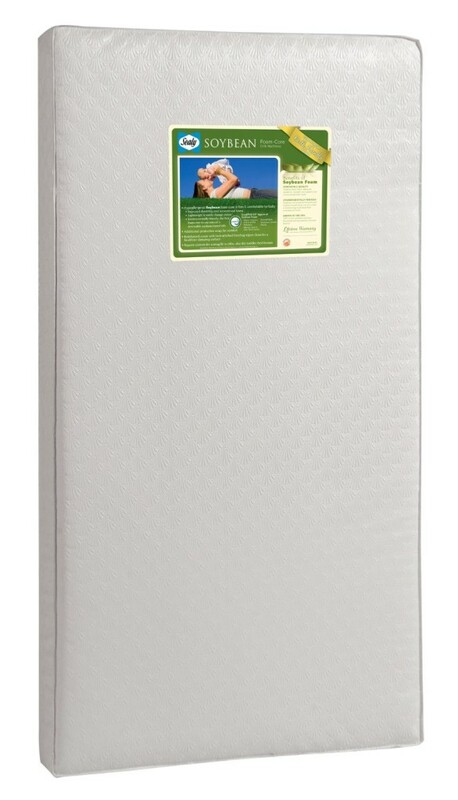 Foam crib mattresses are generally cheaper than the innerspring variety. They are also lighter in weight; therefore, moving and sheet changing is easier. And today, foam mattresses hold up just as well as the classic innerspring mattresses. How do I Find the Best Foam Crib Mattress for My Baby? When looking for a foam crib mattress for your baby, you should choose one that is firm and meets the recommendations of medical experts. If the sleeping surface is soft, it can be a suffocation hazard and increases the chances of SIDS (Sudden Infant Death Syndrome), so be sure the mattress is firm and the bedding fits tightly. Check for resilience. Push down on the centre of the mattress and release, then watch to see how long it takes to regain its shape. It should not conform to your hand’s contours. If it does, chances are it will conform to your baby’s sleeping shape. Keep in mind, vinyl coverings and bindings can tear and crack over time. Regular foam mattress and memory foam mattresses are not the same as they differ in weight. Regular foam weighs about 7-8 pounds; memory foam weighs up to 20 pounds. Remember, HIGHER PRICE DOES NOT MEAN A BETTER MATTRESS. Furthermore, warranties are a marketing ploy and are offered by manufacturers who want you to spend more on their product rather than another. Always check the manufacturers’ labels to read the mattress’s contents and specifications. Be sure to check the fit of the mattress. When shopping, take the time to place the mattress into a display crib. If you can push two fingers between the mattress and the crib, it is too small. Do not look for a mattress that feels comfortable for you. You are purchasing this for your baby, and babies’ bodies need more support than adults. If the mattress feels like something on which you could sleep comfortably, it is too soft for your baby. If possible, purchase a new crib mattress since you do not know how a used mattress has been cared for and stored. Mold and bacteria can grow on mattresses that have not been cleaned or properly stored. They may also be infested with dust mites or bed bugs. You should also consider what material the mattress cover is. This is important because the cover keeps the insides from falling out, and it protects the mattress core. Also look for air vents, which allow air to enter, circulate, and exit a mattress. Air helps prevent mold, mildew, and odor from occurring. A crib mattress should last three years. When you see signs of wear and tear, you should replace it. This mattress is made with soybean oils provided by American farmers, and soy beans are a renewable resource. The cover and binding are waterproof and stain resistant and wipe clean. It is Greenguard Gold Certified, is CertiPUR-US certified, and complies with federal flammability requirements. It offers a comfortable, yet firm sleeping surface for your infant and is made in the USA. The mattress is lightweight for ease of changing sheets. This mattress received the highest rating, a 5/5, on most of the review portals. According to me, this is the best natural foam crib mattress. Reviews for this mattress are mixed. 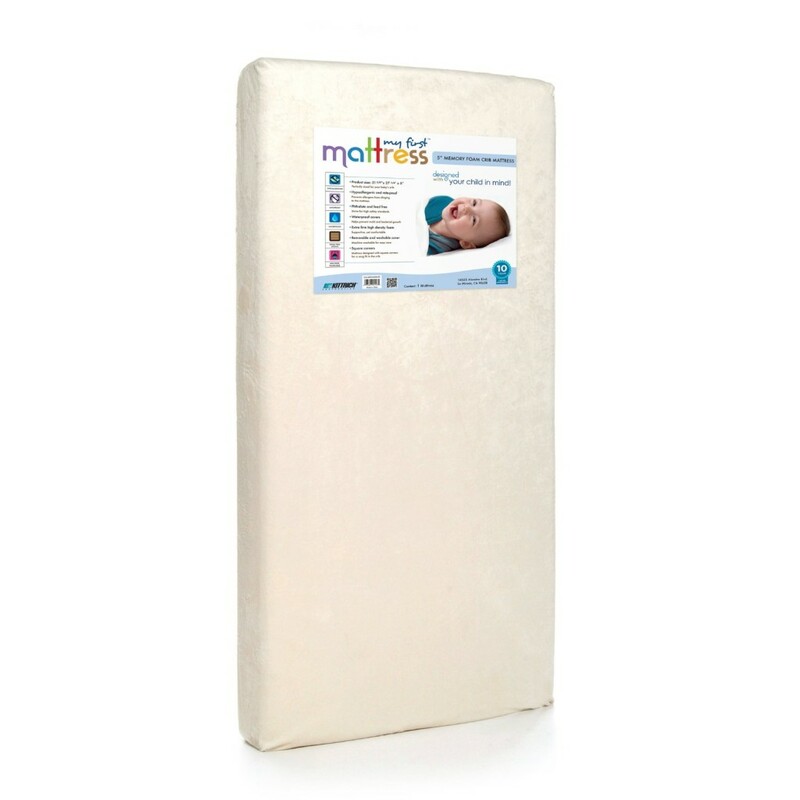 Some customers felt mislead by the clams of being made with soybean oils since companies can call their product soybean-based if it contains as little as 5% soy in it, and this particular crib mattress has less than 30% soybean oil used in foam core. Other consumers did not like the fit of the mattress in the crib, claiming that compression of the mattress corners left sizable gaps between the mattress and the crib. Also, the cover is made of vinyl, so it is not completely organic. It is affordable and offers a lifetime warranty on workmanship and materials. If what I’ve had to say isn’t enough to convince you, take a quick look at Amazon. 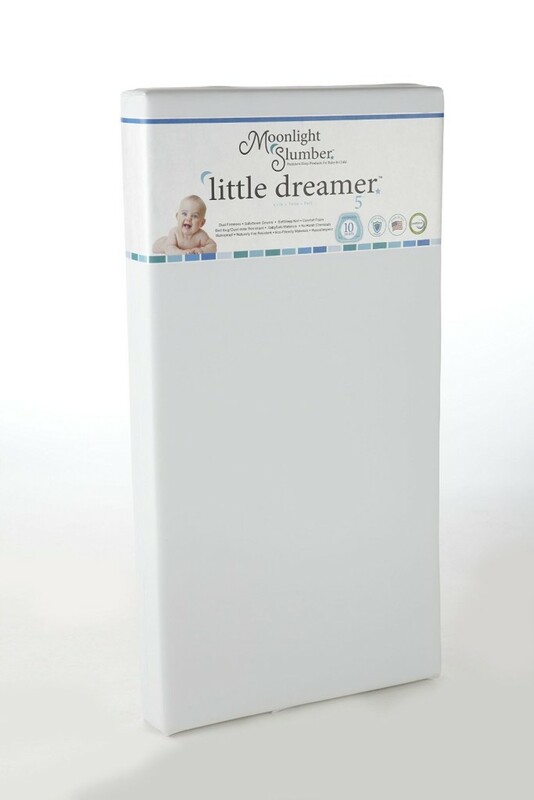 The Little Dreamer is hypoallergenic, safe, and healthy for your baby. It has a dual-sided sleeping surface, with the infant side made of a firm layer of eco-friendly, plant-based foam, and the toddler side is a soft plush. The mattress is five inches thick and has the following features: baby safe natural materials, comfort foam, dual firmness, waterproofed, bed bug/dust mite resistant, safe sewn seams, soft sleep knit, squared corners for a good fit, and naturally fireproof. This mattress complies with federal flammability standards. Most reviews are favorable, with many parents liking the fact that it is made with eco-friendly materials, the comfort of the mattress for their babies, and its durability. This mattress is also made in the USA and has the Green Safety Shield and is CertiPUR-US certified. It has a lifetime warranty against manufacturer defects. About the only negative aspect of this mattress is that it is a little pricey compared to other foam crib mattresses mentioned in this article. If you think this might be the crib mattress you’ve been looking for, take a peek at Amazon, but beware because the deals on price might make you choke on your coffee (in a positive way!). This mattress was manufactured for use with the Graco Pack and Play, which is designed for travel. The Pack and Play grows with your baby, and converts from an infant bassinet to a toddler play yard. The mattress fits most Graco Pack and Plays, and it is built for sleep and play. It is made in the USA, has a bacterial waterproof surface that wipes clean with soap and water, and complies with federal flammability standards. It weighs just three pounds, and the dimensions are 25.5 x 37.5 x 3 inches. Most customer reviews on Amazon are favorable, with most customers recommending the purchase of this mattress to replace the mattress that comes with the Pack and Play. Also, it is advised that you purchase a portable crib sheet to fit this mattress. A standard size crib sheet is too big and will not fit this mattress properly. The Dream On Me Foam Graco Pack and Play Crib Mattress is very affordable. The square corners of this mattress also make for a snug fit in the crib. It is made of comfortable, extra firm high-density foam. The waterproof cover is removable for machine washing and also helps prevent mold and bacterial growth. It has a ten-year limited warranty, is phthalates and lead-free, and meets federal flammability and CPSC standards. My First mattress is hypoallergenic, mite-proof and anti-microbial. Of all the mattresses reviewed here, it is the cheapest. From my experience, I can say that this is one of the best memory foam crib mattresses I have ever used. Most parent reviews are favorable, with customers stating that it felt like a Tempurpedic. However, it was not rated as high as the other memory foam crib mattresses mentioned here. 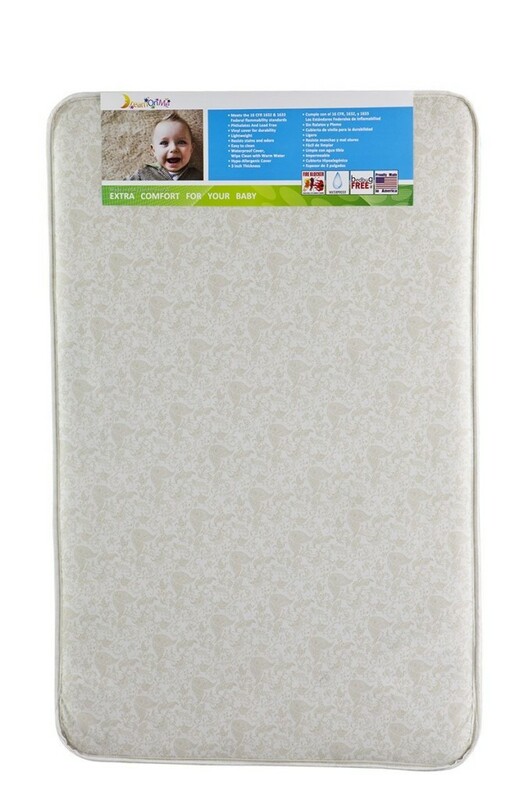 Another affordable foam crib mattress is the Colgate Classica I Foam Crib Mattress. Its square corners fit tightly in the crib, and it is lightweight for easy sheet changing. It is Greenguard certified and CertiPUR-US® certified. The cover is triple layered, waterproof, tear-resistant, non-allergenic, and meets federal flammability standards. It is 5 inches thick and offers extra firm support. Most reviews are favorable, with customers liking the fit, the ease of sheet changing, and the ease of wiping the surface clean. There are a few negative comments about the mattress being thicker than most, thus requiring a purchase of good, quality sheets because cheap sheets when stretched over it would rip. A few customers actually complained about it being too hard, causing their infant to not sleep well on it at all. For a travel crib, the Dream On Me Foam Graco Pack and Play Crib Mattress is the best choice. Of the mattresses reviewed, it was the only travel mattress. The Moonlight Slumber Little Dreamer Dual Firmness All Foam Crib Mattress and the Colgate Classica I Foam Crib Mattress are the best regular foam crib mattresses, offering many features including good fit and most desirable coverings as well as being CertiPUR-US certified. The My First Mattress Memory Foam Crib Mattress and the Sealy Soybean Foam-Core Crib Mattress were also good choices and very affordable. All five mattresses met the federal flammability requirements as set forth in Part 1633 of the Code of Federal Regulations and met the recommendations of medical experts for firmness. They all also fit toddler beds, which is good since you will not have to buy a separate mattress when your child is ready for the next stage. All could be wiped clean with warm, soapy water, then rinsed and dried. Even though the mattresses were waterproof, it was still recommended that you buy a waterproof crib mattress pad or cover for additional protection. In most parent reviews read, apparently price was not their main concern; safety for their infant was. The above-listed mattresses’ safety ratings and reviews were favorable with the Moonlight Slumber Little Dreamer Dual Firmness All Foam Crib Mattress receiving the most favorable parent reviews on safety and other factors listed above.